In 2006 husband and wife entrepreneurs, Mike and Adelle Elder and their children, were inspired to share some of their east coast heritage with Southern California. In a wonderful treat know as Italian Ice. 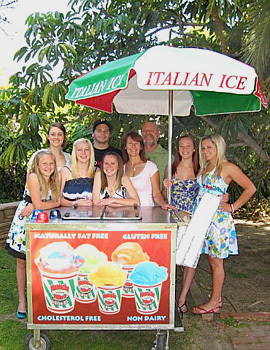 Along with multiple Independent vendors you can enjoy a fresh scoop of this 100 year old secret recipe in communities across the United States at local fairs, festivals, carnivals, party’s and pizzerias with over 120 flavors. It’s hard to decide on a favorite. We call it the “WOW” factor. One taste of this silky, smooth & creamy delicious Non Dairy, Fat Free, Gluten Free and Cholesterol Free frozen fruit sensation and you’ll realize it’s like no other frozen treat you have ever had! To provide the highest quality product, and an easy affordable business opportunity with high profit return on minimal investment, combined with a personalized family style support team. The Mustache Mike’s Italian Ice family is growing fast with a distribution nationally of over 150 carts, trucks and concession trailers, along with the multiple dessert shops, restaurants and neighborhood markets now in 35 states, along with a variety of wholesalers. Please visit our “Find Us” page to mention just a few. We are progressing every week with more and more families, individuals and wholesalers eager to join in the Mustache Mike’s Italian Ice phenomena. Our projections for 2014 and 2015 are exploding. 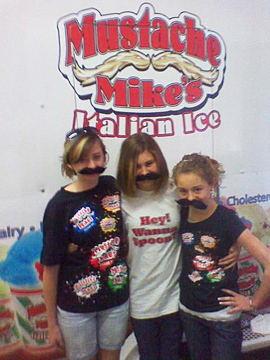 We hope you will be in the future of Mustache Mike’s Italian Ice by joining our family! Run it how you see fit. But you are never alone.